Northwestern’s Veronica Corning prepares to rip off a serve. The senior plans to take her talents to the pro circuit following her time in summer school. On Thursday, The Daily sat down with women’s tennis senior Veronica Corning to talk about her road to Northwestern. Behind Corning’s leadership, this year’s team earned a record of 20-7 overall and 10-1 in conference. The Wildcats triumphed over the Michigan to win the Big Ten Tournament two weeks ago but Notre Dame knocked the team out of the NCAA Tournament last weekend. 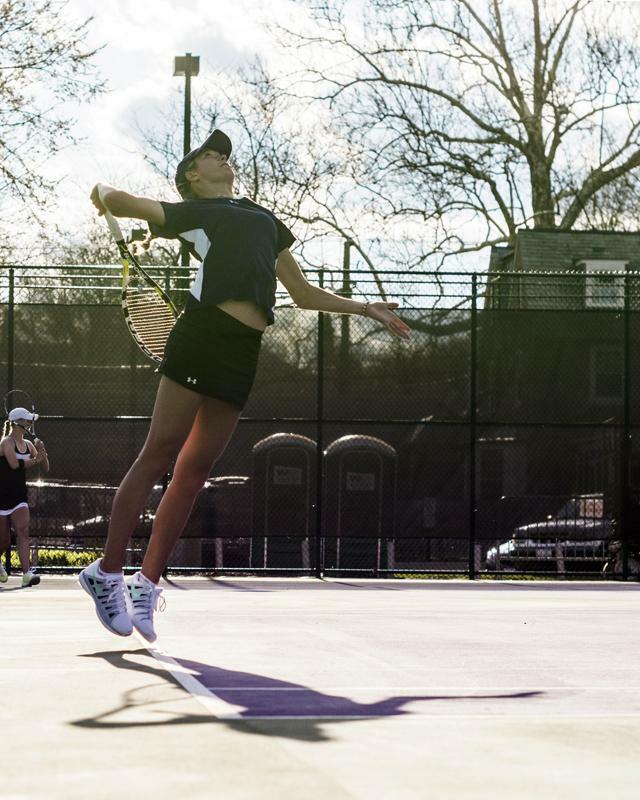 The Daily Northwestern: What got you into tennis originally? Veronica Corning: I started through my parents, both of them played. My dad (played) since he was really young and my mom, when she moved to the U.S., started playing because of my dad and they loved the sport so they got me into it and I really liked it. The Daily: Are there any professional tennis players that you really follow? Corning: Not really. There are some that my other coach actually wants me to look at and thinks I should be like, like (Victoria) Azarenka for example, but I try and watch her now and then but I haven’t followed religiously on someone. The Daily: Are there any particular players that you model your style of play after? Corning: Well, one of the players that I’ve always (idolized) and I really like is Kim Clijsters. I’ve always loved her even though she’s obviously retired. I’ve always valued her game and her movement and the way she plays, I’ve just always loved watching her play. I guess that’s one person I like to follow, but I do try to act and play like Azarenka I guess. The Daily: What made you first decide on going to Boston College for playing tennis? Corning: I guess it was more that it was a local school. When I went to visit, I loved the campus, I loved the team, the coach was really nice. It turned out the program wasn’t exactly what I was looking for when I transferred, so I decided that was the best move for my tennis even though I loved the school and everyone in it. That was the right choice for me. The Daily: What drew you here? Corning: Definitely Claire (Pollard) and the team. I mean the school is obviously a huge pull; it’s a great academic school. I had heard so many great things about this program and how they improve players and that’s what I was looking for: to improve. This program really helped me to do that. The Daily: So you won an award recently, most improved player, how did you feel winning that? Corning: It felt good that all my hard work paid off somehow, and I know that I have improved a lot over the years, it’s nice to be recognized for it. The Daily: What’s the plan since you’re a senior? Corning: After finishing up summer school, I’m going to try the pro circuit and see how it goes. I’m going to try it for at least a year and see how it goes. It’ll be fun! The Daily: What’s the dream, then? Either with tennis or otherwise? Corning: The ultimate dream is to play in grand slams and get a high enough ranking to make a living off of. The small step goals is, in the first year, to get into the top 300 and from there, build my way up and see if I really have what it takes. Either way, it’ll be a great experience traveling, making connections and seeing if I can find a career through there. The Daily: Have you ever thought about coaching? Corning: No, I don’t really want to coach. Hey, if that’s what I want to do later on, but right now it doesn’t look too appealing to me. The Daily: What’s your greatest memory for you in this program over the last three years? Corning: Winning the Big Ten is one that I’ll definitely keep forever, as well as many other memories we’ve made together. But that was definitely really spectacular.